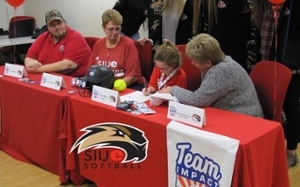 Maine, of Alhambra, has battled myriad medical issues and now joins SIUE softball as part of Team IMPACT. Since 2011, Team IMPACT has matched more than 1,300 children facing serious or chronic illnesses with more than 500 colleges and universities in 47 states, reaching more than 35,000 participating student-athletes. Thursday’s signing event is just the start for Maine. If you know a child who may be interested in Team IMPACT, visit www.goteamimpact.org for more information.